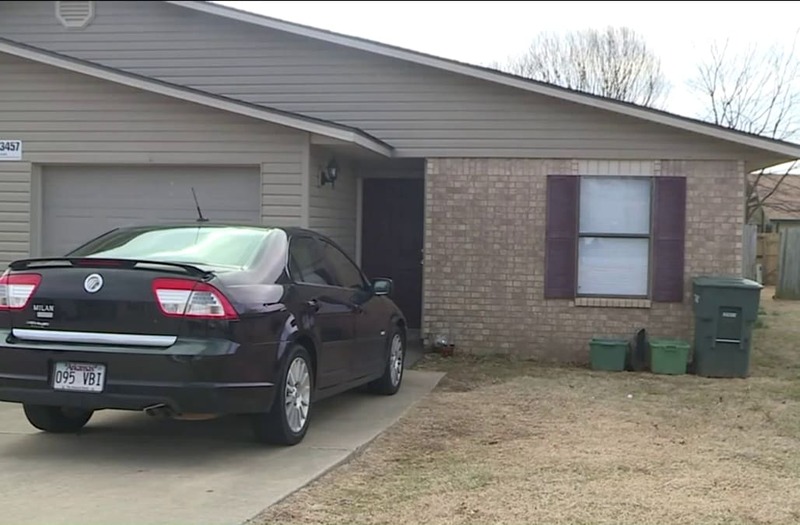 FAYETTEVILLE, Arkansas (KFSM) -- A Fayetteville couple faces child abuse charges after police say they punished an 8-year-old boy by handcuffing him to a table for several hours a day and starving him for months. Melissa Miranda, 33, and Josue Tovias, 28, were arrested Saturday (Jan. 27) in connection with kidnapping, permitting child abuse, second-degree domestic battery, first-degree endangering the welfare of a minor, aggravated assault on a family or household member, first-degree terroristic threatening and tampering with physical evidence -- all felonies. Miranda, who is pregnant and has four other children, singled her son out for punishment because she was jealous that her mother loved him more than her, according to a probable cause affidavit. Miranda said her son refused to stay in timeout and stole junk food from the kitchen, so she and Tovias began handcuffing him to a school desk in their living room between 8 p.m. and 4 a.m., according to the affidavit. Miranda tried to take her son to the bathroom overnight, but eventually had him sleep on a trash bag because he stained the carpet a few times, according to the affidavit. Tovias, Miranda's live-in boyfriend and the biological father of two of their children, denied the allegations. Fayetteville police said he is not the victim's father. Police learned of the allegations on Wednesday (Jan. 24) after officials at the state Department of Human Services alerted them to a possible case of child abuse at the couple's home on Harvard Street. On Thursday (Jan. 25), police went to the boy's school and spoke with staff, who said his appearance had changed drastically since November 2017. They said his eyes and cheeks were sunken and his skin tone changed. Staff also noticed the boy was eating from trashcans and hoarding and stealing food from other students. Staff also said the boy's parents were evasive when confronted about the issues, adding that they refused to bring the boy clean clothes. The school eventually created an alternate eating schedule to accommodate the boy's extreme hunger, according to the affidavit. Miranda said her son only ate about three nights per week for months, according to the affidavit. During an interview with the boy and his siblings at the Children's Safety Center, police found the boy had a distended stomach, was extremely skinny and that bones in his chest and ribs were visible. They also found an injury to his wrist consistent with wearing handcuffs, as well as several healing injuries on his back and spine. Police received a recording from the boy's sister -- allegedly from inside the home -- of Miranda threatening her son after he stole candy from the kitchen while Tovias was present, according to the affidavit. On the recording, Miranda threatened to cut the her son, leave him outside the cold and have him arrested for stealing. Miranda said she would hold a knife her son and say "thieves get their fingers cut off," according to the affidavit. The same sister also told police that her brother is often made to sit and read by himself during dinner. She said Miranda has told her she hates her son and wants him out of the house, according to the affidavit. Police put the boy's school under surveillance and arrested Miranda and Tovias when they arrived to pick up their kids on Friday (Jan. 26), according to the affidavit. Police said Miranda said she was disappointed with her actions and needed help, but was afraid to go to police because she knew she'd face prison time. She also said she had threatened the other children not to tell authorities about the abuse. Miranda said she'd thrown the handcuffs away after DHS officials visited her home, according to the affidavit. Police said DHS has taken custody of the children. Miranda and Tovias were being held Monday at the Washington County Detention Center on $50,000 bonds. Both have hearings set for Feb. 28 in Washington County Circuit Court.